Kanyon is a multi-purpose complex in the Levent financial district of Istanbul, Turkey, which consists of a shopping mall, a 30-floor office tower (26 floors of which rise above Büyükdere Avenue level) and a 22-floor residential block. It unites 179 residential apartments, an office tower and a 160 store retail space (covering an area of 37,500 m²) to undulate around a dramatic architectural “canyon” since its debut in June 2006 . The total construction area of the project is 250,000 m², with 30,000 m² of rentable office area, 37,500 m² of rentable retail area, 180 residential flats, 160 stores, 9 theater halls with a capacity of 1,600 spectators and a parking facility for 2,300 vehicles. Each floor of the office tower has a total usable office space of 1,167 m². The complex rises on an area of 29,427 m² . 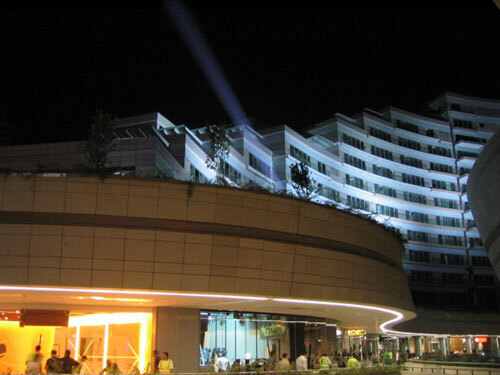 Kanyon is a joint venture of the Eczacıbaşı Group and İŞGYO of Turkey. It was designed by The Jerde Partnership of Los Angeles, USA, who collaborated with Tabanlıoğlu Architects of Istanbul, for developing the project. Ove Arup & Partners of London, UK, undertook the structural engineering and consultancy works, while Tepe Construction of Istanbul, Turkey, was the main construction company. IMS Engineering of Istanbul, Turkey, was responsible for the project management. Kanyon’s four retail levels are set in a primarily open-air environment, much like a city street. Indeed the project developers aimed at duplicating the Nişantaşı feel, the posh shopping district of Istanbul. Wrapped around the dramatic interior canyon, each "street" gives shoppers the chance to connect with brands in a new way. However, unlike a city street, most walking areas are covered and climate controlled, blending natural light and open-air with comfort that allows visitors to enjoy every season without suffering its excesses. This dramatic environment is in part what has encouraged dozens of brands to enter Turkey for the first time. Wagamama, Douglas, Bally, Fresh Line Homemade Cosmetics are just a few of the prestigious names joining world-renowned Harvey Nichols in debuting in Turkey. Kanyon won the 2006 Cityscape Architectural Review Award in the "Commercial Built" category, during a ceremony which was held in Dubai, United Arab Emirates, on 4 December 2006 . However, there has been strong growing resentment against such complexes as they are often built without taking into consideration of perimeter traffic,causing unbearable congestion nearly 15 hours a day and serving only to .01 percent of Istanbul citizens with such spending capacity.